I've never been a person of religious sentiments, so it has been difficult for me to have much faith in dieting. Much like systems of spiritual belief, confidence in different ideologies of weight loss have always struck me as suspect. However, thanks to the advent of online video, it is hard to deny that there really should be less of me. For example, the difference in size between a performance in 2008 at the Annenberg Center and one in 2010 is particularly marked. So I find myself polling people at the university, from an administrator who swears by consuming only brussels sprouts for a month to a faculty member in the Math department, who has posted his conversion story online. I'm tempted to solve this problem of daily life with my iPhone, as I do most everyday needs. So I downloaded a pedometer app and soon went out to walk, jog, and run to burn calories and participate in a new culture of self-monitoring where people track stats from the most intimate aspects of their lives. Each day of personal surveillance I can peruse charts where my vital signs have been tracked from second-to-second much like an intensive care monitor. After testing out this application, I soon discovered a number of technical flaws. First, like many apps, the pedometer seems to turn off when the phone rings or a text message arrives. As someone who often checks e-mail while waiting for a crosswalk to be greenlighted, this is a significant design flaw. 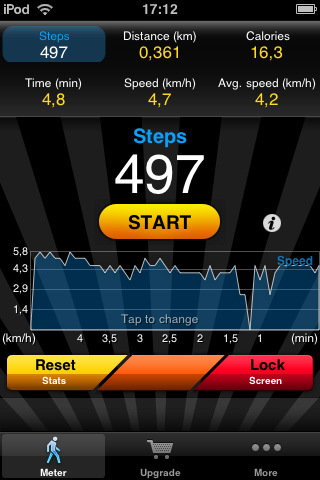 I'm not sure that one can listen to the mp3 player on the phone while exercising and still keep track of one's steps. Second, it measures distance much more accurately if stored in a pants pocket rather than the pocket of a sweater or jacket. This led me to a frustrating search for exercise pants with pockets, which were strangely unavailable at a number of retail outlets. I actually found a number of pairs with fake pockets merely for decoration! If only I could download an iPhone app like the music recognition app Shazam where I could point my phone at a plate of food and be told the calories it contains.